Liquid Deicer vs. Salt: What’s best for removing ice from commercial properties? Getting rid of snow and ice on your commercial property isn’t as simple as it used to be, whether you manage an HOA, apartment building, or a retail facility. The need to increase safety is also higher than ever, with insurance companies taking a much closer look at how vulnerable a property is due to potential slip and fall lawsuits. For this reason, it’s important for property managers to have full confidence that their snow removal contractor is working efficiently. Here at Schill, we take pride in finding the most effective products to combat ice on the commercial properties we service. There are hundreds of different products (and blends of products) used to melt ice: from bulk salt, to brine—which is essentially liquid salt, to liquid deicer (which comes in many varieties itself). So, when it comes time for property managers to discuss their options with their commercial snow removal contractor, it’s understandable that the choices can seem a bit overwhelming. Liquid deicer is a fairly new product within the Northeast Ohio snow removal industry, but it’s one that the more innovative companies have started to pay serious attention to. Liquid deicer works as a pre-treatment by keeping snow from bonding to the pavement, so that after snow is removed, ice doesn't reform as quickly and therefore less post-treatment deicer is needed. The Schill team has had about 2 full winters to experiment with liquid deicer, which we use along with salt on many properties, and we wanted to share our list of the pros and cons both. It tends to be cheaper. Though this isn’t always the case, liquid deicer does tend to be less expensive than salt when you pay by application versus paying for salt in bulk. For years, it has been standard industry practice for snow contractors to charge for salt by the ton. This doesn’t encourage crews to pay close attention at all to how much salt they’re putting down, let alone measuring in pounds exactly how much is being spread. 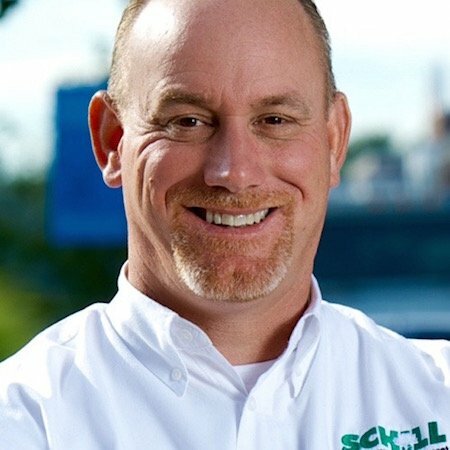 Due to our sustainability initiatives, the Schill team is always looking to eliminate waste. This means monitoring our salt output and becoming a champion of other snow contractors charging per application of salt instead of per ton. Charging this way encourages crews to be more conscientious of how much material they’re putting down. Liquid deicer causes less damage. Liquid deicer can be applied with much more precision than salt, which spreads as it’s sprayed. For this reason alone, it often causes less damage than bulk salt. We experienced this first hand when we began using liquid deicer last winter at Crocker Park. In the past, we’d replace around 20 trees per year on the massive 75+ acre lifestyle center, which gets serviced 7 days a week in the winter. This spring, that number was under 5, which is a savings of thousands of dollars. This one might be a corollary to our first point, but overall, it takes fewer crew members to apply liquid than it does bagged salt. If you have a full service seasonal contract, labor costs might not be something that concerns you, but for clients who are billed monthly, this is a huge benefit. Fewer workers on your property might not only lead to lower costs up front, but it can also make for a less intrusive snow removal experience. It takes longer to work. In general, liquid deicer takes longer to melt ice than salt does. This is why we use it most often as a pre-treatment solution for preventing the formation of ice on the walkable surfaces of your commercial property. During the winter months, we’re constantly monitoring the weather for any signs of impending snow or ice. As soon as we think a freeze or snow fall is coming, we’re heading out to properties that have full-service seasonal contracts to apply pre-treatment. Liquid deicer works well here, as it keeps ice from bonding to the pavement. 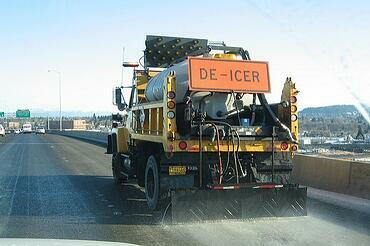 But deicer can be slower than desired for removing ice once it’s already on the ground. So, for our clients who request service only after snow reaches a certain height in inches (usually 2-4 or 4-6), we sometimes rely more on salt simply because it works faster. Even though liquid deicer can be applied by fewer people, the average crew spends much less time putting salt down. If snow is falling rapidly time (or the lack of it) is always an important factor to consider. You might be thankful for this if snow starts to fall heavily right before your business opens. Salt can damage plants, buildings, and interiors. Another reason why we think it’s so important that crews are conscientious of how much salt they put down is because using too much salt can cause a lot of damage. As mentioned above, sodium leaches moisture away from vegetation and can essentially cause your turf, trees and shrubs to dry out. You may not notice the damage done until spring, when trees and shrubs don’t leaf out. But the damage doesn’t stop there: salt can cause erosion on even the most durable of surfaces. 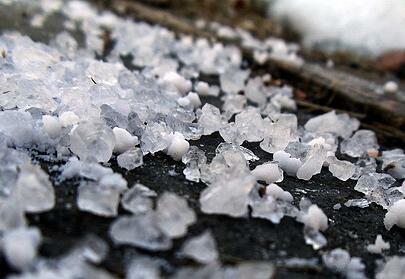 Overtime, salt particles crystallize in porous materials like stone and eventually cause them to crumble. When it’s tracked indoors on people’s shoes, it can wreak similar havoc on wood, tile, and carpet. The price and supply of salt can be unstable. Winters with heavy snowfall will always lead to an increase in the demand for ice melt products. This is not only the case for salt, but also liquid deicer. What makes salt prices so much more unsteady is that there is a finite supply of it. When harsh winter weather hits, governmental and municipal transportation departments always get top priority. This leaves commercial snow contractors in steep competition for whatever is left. Basic economics dictates that when demand for a commodity rises, so does price. As we said before, salt scatters when it’s applied. That’s just the nature of the product: it bounces along pavement where it lands and gets moved easily when people displace it as they walk. An apples to apples comparison in volume of salt vs liquid deicer will show that salt loses in the sheer amount that generally gets applied. So why aren’t more people requesting Liquid Deicer for their commercial properties? 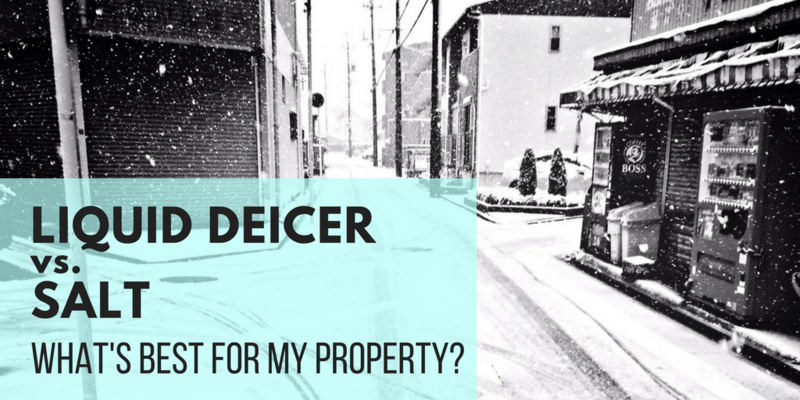 Despite the fact that liquid deicer has been used for years by municipal transportation departments in larger metropolitan areas, it’s still fairly new concept for many property managers. And, as with any new product (especially a chemical one), deicer will take some time to make inroads within the market. As always, the Schill team is here to help. If you’d like talk with anyone about the benefits of incorporating liquid deicer into your commercial snow removal routine, please reach out to us today. In Northeast Ohio, it’s never too early to start thinking about winter.